Fig. 1. Artist impression of one of the Mars Exploration Rovers on the martian surface. Fig. 2. 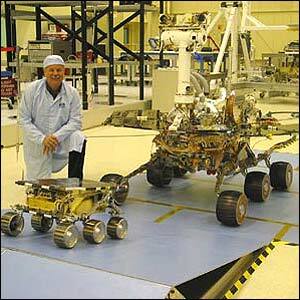 Models of Sojourner and Mars Exploration Rover. Fig. 3. Main components of MER labeled. Fig. 8. Mars landing sites. The Mission Exploration Rover was a NASA mission to Mars consisting of two identical rovers, called Spirit and Opportunity, each with a mass of about 180 kg, that will be landed by an airbag system similar to that used by Mars Pathfinder. Spirit was launched on June 10, 2003, and Opportunity on July 7, 2003. 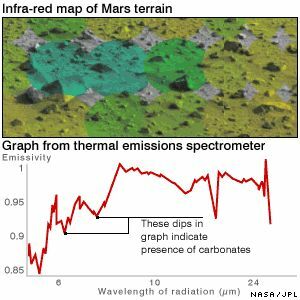 The landings took place successfully on January 4 (Spirit) and 24 (Opportunity), 2004, at two widely-separated sites on Mars selected because they appear to have been associated with liquid water in the past and may therefore have been favorable to life. Spirit landed in at Gusev Crater, a possible ancient lake feature. Opportunity touched down on Meridiani Planum, which contains minerals often associated with water. Although the rovers will not search for organic remains directly, they will seek to determine the history of climate and water at their sites, which has a direct bearing on the issue of possible martian biology. For this reason, the vehicles are often referred to as roving field geologists. Immediately after landing, the rovers will begin reconnaissance of their landing sites by taking 360° visible color and infrared image panoramas. After several days of evaluating the surrounding terrain, and deploying and calibrating instruments, they will drive off to begin their exploration. Using images and spectra taken daily from the rovers, mission scientists on Earth will command the vehicles toward rock and soil targets of particular interest, and then evaluate their compositions and textures at microscopic scales. Initial targets will be close to the landing sites, but later targets are expected to be much farther afield. The rovers will be able to travel up to 100m per martian day (24 hours 37 minutes) – as far as Pathfinder's Sojourner rover did in its entire lifetime. 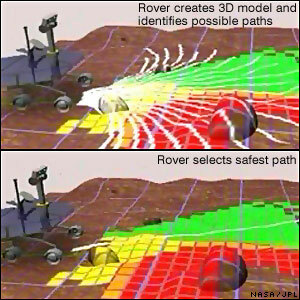 Each rover will carry the Athena scientific package (originally designed for a rover mission in 2001 but cancelled in the wake of two mission failures in 1998), including cameras and tools to grind and analyse rocks. Developed at Cornell University, the instrument package consists of a panoramic camera (Pancam), a rock abrasion tool (RAT) to expose fresh surfaces of rock, a miniature thermal infrared spectrometer (MiniTES), a microscopic camera, a Mossbauer spectrometer, and an alpha-proton-X-ray spectrometer (APXS). The rovers are each expected to function for at least at least 90 days. Each rover has nine cameras. Two 'navcams' and four 'hazcams' help it orientate itself and avoid hazards. 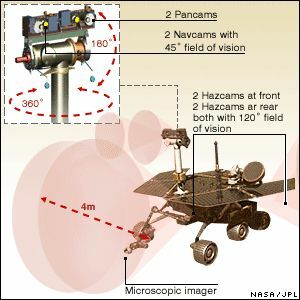 Two panoramic cameras mounted on a mast above the body of the rover take high-resolution images to be sent back to Earth. The rovers also have microscopic imagers – combining a microscope and camera – for taking close-up shots. See Fig. 4. 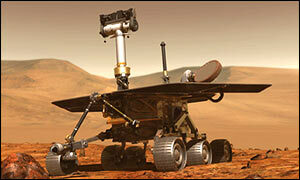 Each rover can travel up to 100 meters a day. Scientists tell it a point to go to, but it works out how to get there itself. It creates a 3D map of the terrain, and stops approximately every 30 centimeters to calculate the safest path towards its target. The rovers have special 'rocker-bogie' systems enabling them to stay balanced on rough terrain. See Fig. 5. 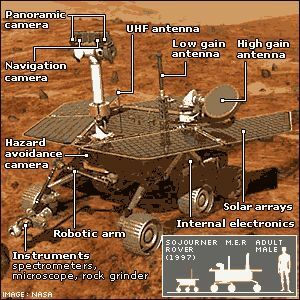 Each rover has three spectrometers – instruments which can identify minerals from the way rocks emit radiation. By analysing infra-red radiation, the NASA team have identified carbonates – rocks formed in the presence of water – on Mars. A second spectrometer looks at X-rays and alpha particles, a third examines iron-rich substances. See Fig. 6. 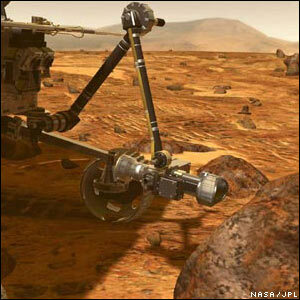 A rock abrasion tool mounted on each rover's robotic arm can drill 45 millimeters into rock. This will enable scientists to compare the surfaces and insides of rocks, giving clues about any weathering processes taking place. Each rover also carries an array of magnets, which will collect dust and analyze its magnetic properties. See Fig. 7.